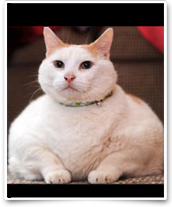 2) The subsequent increase in feline obesity. Cats are carnivores. Their teeth are designed to tear meat, not grind grain. Their gastrointestinal tracts don’t supply a lot of sugar- digesting enzymes. They have more fat digesting enzymes. Their pancreatic insulin-sereting cells can’t keep up with metabolizing excessive carbohydrate/ sugar loads. All these facts tell us that cats should eat a high protein, low carb diet. In fact, science has now demonstrated what cats have known for millennia: mice are the perfect cat food! Protein, fat and carbs all in the right proportion! Yumm! Since we humans don’t want the fuss and mess of feeding our cats live mice (and most cats wouldn’t eat pre-killed mice), we are forced to try to feed them a suitable artificial diet. So, we have devised prepared dry and canned foods full of carbohydrates (because they are a cheap source of calories and provide a good binder for dry foods). These foods are easy to eat quickly and are often provided all day long, “free choice”. Furthermore, more of our cats are kept in safe indoor environments which limit their activity and encourage boredom eating, contributing to obesity. Cats tend to store fat intra-abdominally. This fat is the most hormonally active fat, being the biggest contributor to insulin resistance. The result is, that our domestication and interest in economizing on their food sources has put them at risk for a debilitating and problematic disease– Diabetes. Preventing Diabetes in cats is much easier than treating. Treatment involves strict adherence to a special diet, usually twice daily insulin injections that have to be given without fail, every day at the same time, tying you to your home and cat rather inflexibly. Diabetes in cats tends to be complicated by other coexistant metabolic diseases such as pancreatitis, cholangiohepatitis and inflammatory bowel disease. Most of these patients end up on numerous medications to balance all these conditions to maintain a kitty’s active lifestyle. It’s an overwhelming condition, requiring the most dedicated of owners for proper care. If you are like most cat owners who like cats because they usually DON’T require a lot of our care, except petting, feeding and litter box cleaning, you just don’t want to go down the Diabetic Road with your kitty. Prevent Obesity. Regardless of the food you provide, feeding limited quantities in 2-3 meals daily will help keep your cat trim and will protect him from diabetes. Vigorous exercise, whether in a safe, enclosed outdoor arena (because most of us find vet trips to repair injuries from predators and cars quite inconvenient and entirely unconducive to a long kitty lifespan) or through several exhausting (for the cat, not you!) play period indoors will help keep your cat more mentally alert as well as fight the creeping calories. Feed a “Kitty Atkins” diet. High protein and low carb diets are the best for cats. These are not readily available over the counter yet, so ask your veterinarian for a recommendation. Special concerns are whether your kitty has renal disease or other medical conditions that may preclude this kind of diet. But, most healthy adult cats will benefit from a higher protein diet than most over the counter diets. Feed more wet food (than we have in the past). Wet food, by its nature, usually has lower carbohydrates than dry food. But still feed a high quality brand. There are even canned “kitty atkins” formulations available through your vet. Some over-the-counter foods are better than others. “Fancy Feast”, by Purina, actually has one of the lowest carbohydrate contents on the market. In my practice, I emphasize weight control. I recommend Royal Canintm Neutered Male formula, specifically designed to be lower in calories from carbs and higher in protein than over-the-counter foods (it is also urinary tract protetcive) for my overweight middle aged cats–male and female. (** Obese Middle-aged Male Orange Tabby cats are 30% more likely to get diabetes than any other cat! 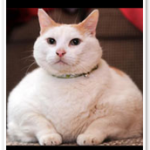 **) For cats that stay overweight, I offer clients an annual Fructosamine test as part of their wellness testing. This test reflects the average blood glucose level over the last 3 weeks. It can be an early indicator of diabetes. * Decreased grooming, rough coat. * Increased water drinking or water-seeking behavior (drinking out of water glasses, the sink, shower). * Weight loss, especially in the face of ravenous appetite.